Do trees on the streets make people happy? The government says spending £4.2m on planting trees in towns and cities - particularly in deprived areas - will improve the quality of people's lives. Does foliage actually do this? But the government's Big Tree Plant campaign - which aims to plant one million trees in English urban areas over the next four years - claims trees are not only good for our bank balance, but they do wonders for our well-being. And it says getting people involved in the planting process makes communities even happier. So do people really care about trees and do they enhance lives - or is it all wishy-washy nonsense? Margaret Lipscombe, director of urban programmes at the Tree Council, says trees bring a plethora of benefits to people's lives. "Not only are trees beautiful but they are practical. They provide shade in the summer and then their leaves drop off, allowing light in when it is needed in winter. "They are good for local climate change because they put water back into the atmosphere which cools the area. And they help biodiversity as tree-lined streets provide wildlife corridors for birds or insects to travel. "Trees also encourage healthier lifestyles and studies have shown people are calmer when trees are in their environment," she says. The idea that trees have a positive effect on health has been around a while, but it is one that is hard to measure. A Dutch study suggests every 10% increase in green space can postpone health complaints in communities by five years. And a US study is regularly cited to suggest patients that have a view of nature through hospital windows recover better after surgery. Earlier this year, the environment secretary at the time, Caroline Spelman, put a figure on it - in some inner city areas, each tree was worth as much as £78,000, she said. Ms Lipscombe argues the calming influence of trees has even been known to slow down driving speeds as drivers tend to go more slowly when something is in their peripheral vision. She concedes some people have negative feelings about trees - because they worry about slipping on berries, bird droppings on cars or blocked light - and there can be a 'Not In My Back Yard' mentality. Certainly the number of huge broad-leafed trees, so loved by Victorian planners that they became a permanent part of British urban landscape, have seen a sharp decline over recent years. In 2007, a London Assembly referred to the loss of 40,000 full-grown trees in the capital over a five-year period as a "chainsaw massacre", suggesting a "risk-averse" culture among councils was partly to blame. But one person who credits new trees with changing her life is Annamaria Mignano, 47, who lives in a warehouse conversion in Tower Hamlets in London. She says when she first moved into the area there were no trees on her street - or two of the roads that led to it. "It was a concrete thoroughfare in an area where there are lots of factories with high walls, it was desolate, looked abandoned and aggressive, and was the kind of place that you didn't want to be, especially as a woman on your own. 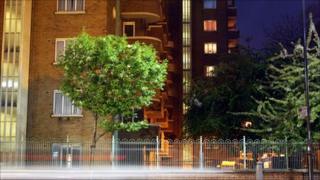 "It sounds a bit naff and middle-class but once trees were planted in 2000 it really softened the street. It looks more appealing, people aren't as scared and no longer run down the road to get home. It has definitely made me more happy." The 30 trees have also brought people out onto the streets and created more of a community feel, she adds. It is a feeling that is echoed in another part of Tower Hamlets, Manchester Estate, where Trees for Cities chief executive Sharon Johnson says getting the community involved in planting trees - and choosing what types of trees to plant - has had a big impact on a deprived area. "The urban wasteland was blighted by litter and graffiti, but by adding shrubs, fruit trees, willow hedges and a woodland area we have turned it into a utilised community place. "There is also a natural play area - with logs and boulders which children run over and through." Ms Johnson says engaging people with the space they live in, and giving them a sense of ownership, makes them want it to succeed so trees rarely become the victims of vandalism. There was a problem with people training their pit bulls or fighting dogs to chew bark to strengthen their jaws a few years ago but their presence can actually reduce crime, she says. "It really hit me that we had made a difference when a man that lived there who had been looking for a housing transfer said he was reconsidering his plans now he had this space on his doorstep." Ms Johnson argues it is a pattern that is repeated throughout the country, highlighting a sensory garden and orchard at an autism centre in Sheffield as a particular success. But not everyone is convinced that planting trees is the best solution. Shaun Bailey, a community worker in the west of London thinks there are far bigger issues that need addressing, and warns against getting carried away about trees. "There is no point in it looking pretty if you live in a rubbish place, it's a false investment. "Council housing, who pays and how, is far more important. We should stop building sink estates, look at the social mix of housing and incentivise people to live together." Making shared ownership viable for people on low incomes should also be a priority, he adds. "One of the great British traditions is moving house, we should be helping people own houses so that they have the opportunity to trade on them. "Perhaps planting trees is the beginning of making a shared and decent living space, but I've lived in a lot of estates and they would not have changed my life. "People want to express themselves with bricks and mortar, not trees."